The program can’t start because d3dx9_42.dll is missing from your computer. Try reinstalling the program to fix this problem. But don’t worry. Many users have resolved their problem with the solutions in this article. You can try the methods below to fix the d3dx9_42.dll missing or not found errors easily. The d3dx9_42.dll missing or not found errors are caused by the Windows DirectX issues, and DirectX is used by many Windows based games and graphics programs. What’s more, this error more commonly occurs when trying to play video games. So you should try to reinstall the d3dx9_42.dll file in your computer since there may be something wrong with the file, and you should also try to update DirectX in your Windows computer and the related GPU to fix the issue. If d3dx9_42.dll is missing or not found in your computer, you can fix your problem by restoring the missing file in your computer. To do so, use the DLL-files.com Client. 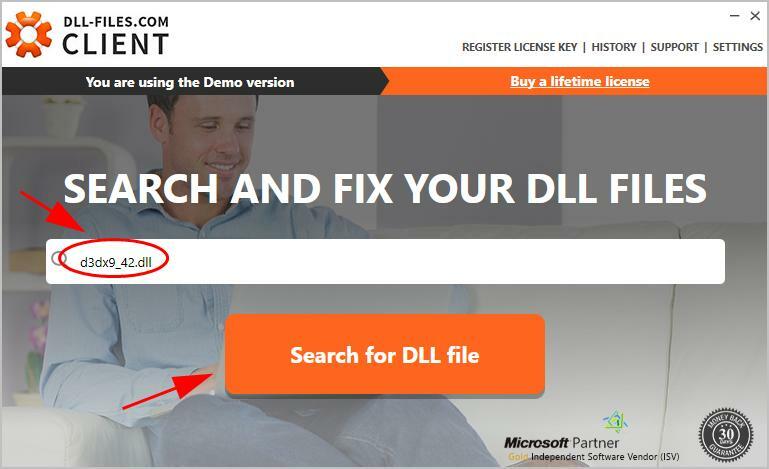 The DLL-files.com Client will fix your DLL error in one click. You don’t have to know what system is running on your computer, and you don’t need to worry about downloading the wrong file. The DLL-files.com handles it all for you. 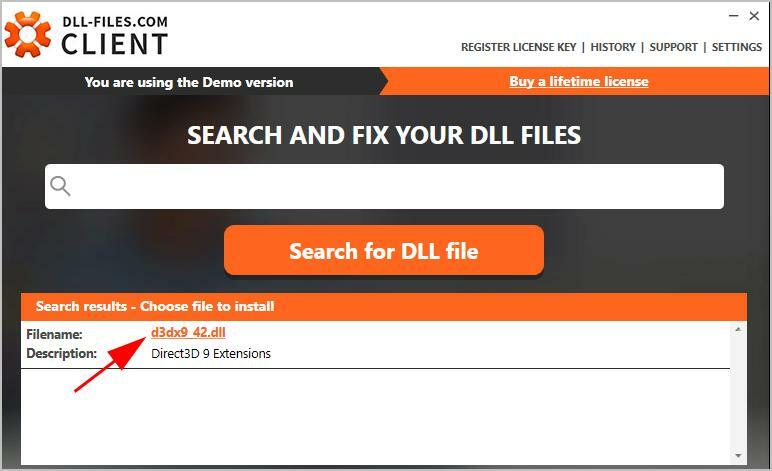 Download and install the DLL-files.com Client. Type d3dx9_42.dll in the search box and click Search for DLL file. Click d3dx9_42.dll in the search result. Click Install (you’re required to register the program before you can install the files – you’ll be prompted when you click Install). Once install, check if your d3dx9_42.dll missing problem has been fixed. The DirectX End-User Runtimes package provides updates to 9.0c and previous versions of DirectX – the core Windows technology that drives high-speed multimedia and games on the PC. So you can fix the d3dx9_42.dll not found or missing errors by installing this package. Note: It’s recommended to download and install the dll files from official website, and do not install the dll file from unknown source to avoid internal corruption and potential risks. 1) Go to Windows End-User Runtimes download page. 2) Select the proper language for your computer, and click Download. 3) After downloading, run the file and follow the prompted wizard to finish. 4) After installing, restart your computer and try the program that gave the error to see if it works now. This should resolve your issue. If not, don’t worry. We have other solutions for you. You can also update the DirectX version in your computer to the latest version to fix the d3dx9_42.dll not found or missing errors. 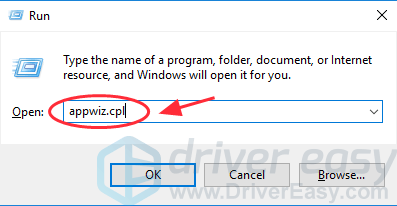 Generally speaking, for Windows 10, Windows 8 and Windows 8.1, you can directly update your Windows version to the latest version to install the latest DirectX in your computer. However, if you’re using Windows 7, Windows Vista and Windows XP, you’ll need to install a update package to install the latest DirectX in your computer. You can go to Microsoft website for get more information about how to install the latest version of DirectX on different Windows versions. After updating, restart your computer and try the program again to see if the error disappears. 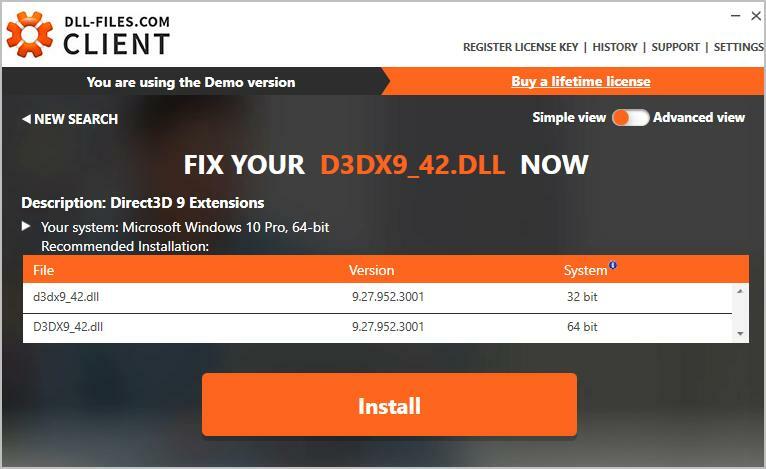 There may be something wrong with the system file when installing the application, so you can reinstall the application to fix the d3dx9_42.dll not found or missing errors. Why? Because the program’s installation files may include the correct version of the d3dx9_42.dll file. 2) Type appwiz.cpl and click OK.
3) Right click on the program that gave the error (in my case it’s Python), and select Uninstall. 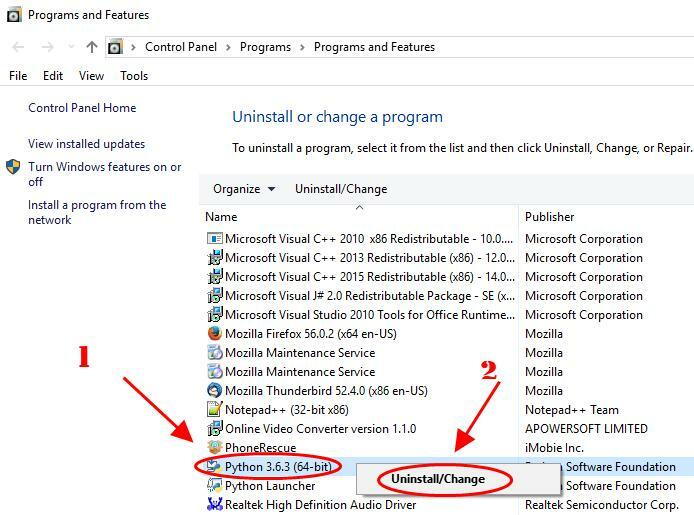 4) Click Yes to confim you want to uninstall the program. 6) Reinstall the program and launch the program. Find another computer that runs the same operating system as yours. The versions (Windows 10/8/7) and architectures (32-bit/64-bit) of both operating systems must be the same. On that computer, open File Explorer (by pressing the Windows logo key and E on your keyboard), then go to C:\Windows\System32 and copy the d3dx9_42.dll there. Try launching the program again and it should be working. There you have it – five ways to fix the d3dx9_42.dll not found or missing errors. Please feel free to leave your comments and ask any questions.